Obama became the first African-American President of the U.S. when he was elected to the office in November, 2008. 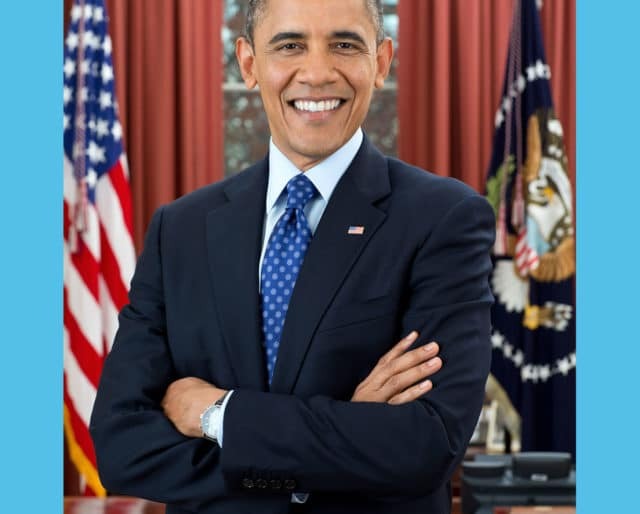 Prior to serving as the U.S. President, Obama was a U.S. Senator from Illinois and, before that, an Illinois State Senator. He was born in 1961 in Hawaii to an American mother and Kenyan father. His early years of schooling were spent in Jakarta, Indonesia, prior to moving to Honolulu to live with his maternal grandparents. He is a graduate of Harvard Law School and continues to be a leader within the Democratic Party. Obama gives a victory speech before tens of thousands of supporters in Chicago's Grant Park after winning the 2008 Presidential election. Obama is sworn in as a U.S. Senator from the state of Illinois. The former President is first sworn in to the Illinois State Senate, where he would serve for seven years. Obama meets former First Lady Michelle Obama while working as a summer associate at the Chicago law firm Sidley Austin. Obama returns to the state of his birth, Hawaii, after spending four years with his mother in Indonesia. President Obama was a community organizer and a promoter of community service. Celebrate his birthday by spending the day volunteering for a local charity or nonprofit. They'll appreciate the help. President Obama could give a speech. His speech at the 2004 Democratic National Convention set the stage for his Presidential run in 2008, and his State of the Union speeches are always worth revisiting. The former President's memoir, Dreams from My Father, was an international bestseller and tells the story of his childhood in Hawaii and Indonesia, and his path to Harvard Law School and into politics. You can pick up a paperback copy for about 10 bucks. The former President loves U.S. history, and cited this biography of Grant as a favorite. This 2017 Pulitzer Prize winner tells of the housing struggles faced by low-income families in Milwaukee. This work of fiction tells the story of the Bolshevik Revolution through the eyes of a Count under house arrest. A woman dying of terminal cancer reflects on her life, all written in a matter of weeks. The President is a baller, and this book is for basketball aficionados the world over. President Obama made history when he became the first African-American President of the United States. Each of his 43 predecessors was a white male. His election was a signal to a generation of African-American kids that they could one day themselves be President. President Obama was elected at the tail end of a recession, and he supported policies that helped turn the economy around. Unemployment rates were reduced during his Presidency, and working with leadership in both parties, the country returned to economic stability. Although controversial, the President's Affordable Care Act helped provide health insurance to millions of formerly uninsured Americans. It also protected people suffering from pre-existing conditions.